This is our best selling, washed cotton twill, 6-panel, unconstructed, low crown cap. 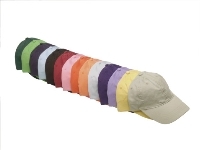 A true classic, it comes with a pre-curved visor and adjustable self strap. Available in fun, bright colors.